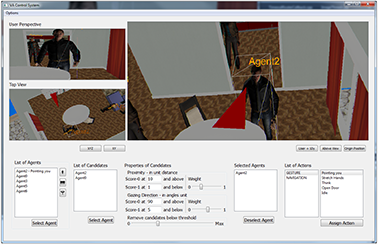 When interacting and communicating with virtual agents in immersive environments, the agents’ behavior should be believable and authentic. Thereby, one important aspect is a convincing auralizations of their speech. 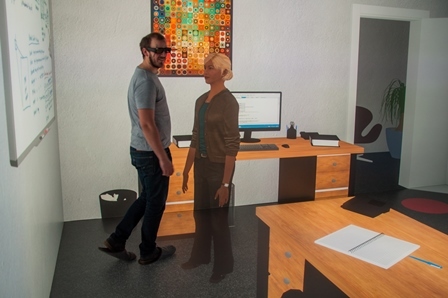 In this work-in progress paper a study design to evaluate the effect of adding directivity to speech sound source on the perceived social presence of a virtual agent is presented. Therefore, we describe the study design and discuss first results of a prestudy as well as consequential improvements of the design. Controlling user-agent-interactions by means of an external operator includes selecting the virtual interaction partners fast and faultlessly. However, especially in immersive scenes with a large number of potential partners, this task is non-trivial. Thus, we present a score-based recommendation system supporting an operator in the selection task. Agents are recommended as potential partners based on two parameters: the user’s distance to the agents and the user’s gazing direction. An additional graphical user interface (GUI) provides elements for configuring the system and for applying actions to those agents which the operator has confirmed as interaction partners. Traditionally, experimental economics uses controlled and incentivized field and lab experiments to analyze economic behavior. However, investigating peer effects in the classic settings is challenging due to the reflection problem: Who is influencing whom? 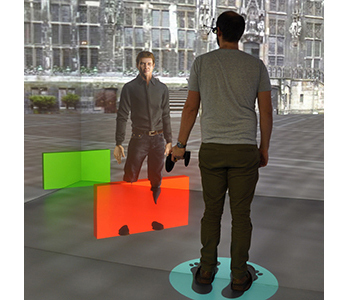 To overcome this, we enlarge the methodological toolbox of these experiments by means of Virtual Reality. After introducing and validating a real-effort sorting task, we embed a virtual agent as peer of a human subject, who independently performs an identical sorting task. We conducted two experiments investigating (a) the subject’s productivity adjustment due to peer effects and (b) the incentive effects on competition. 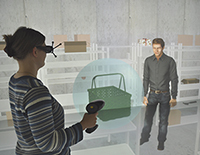 Our results indicate a great potential for Virtual-Reality-based economic experiments. 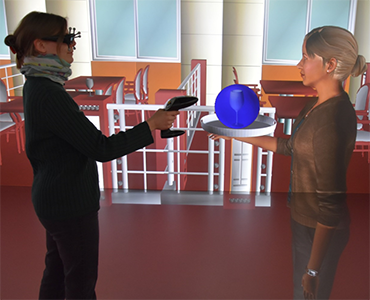 Computer-controlled, human-like virtual agents (VAs), are often embedded into immersive virtual environments (IVEs) in order to enliven a scene or to assist users. 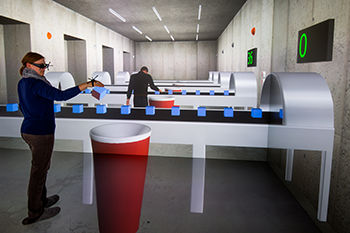 Certain constraints need to be fulfilled, e.g., a collision avoidance strategy allowing users to maintain their personal space. 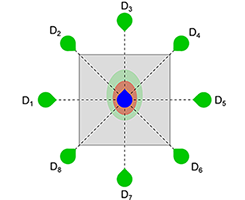 Violating this flexible protective zone causes discomfort in real-world situations and in IVEs. However, no studies on collision avoidance for small-scale IVEs have been conducted yet. Our goal is to close this gap by presenting the results of a controlled user study in a CAVE. 27 participants were immersed in a small-scale office with the task of reaching the office door. Their way was blocked either by a male or female VA, representing their co-worker. The VA showed different behavioral patterns regarding gaze and locomotion. Our results indicate that participants preferred collaborative collision avoidance: they expect the VA to step aside in order to get more space to pass while being willing to adapt their own walking paths. Honorable Mention for Best Technote! user study in a CAVE. 27 participants were immersed in a small-scale office with the task of reaching the office door. Theirwaywas blocked either by a male or female VA, representing their co-worker. The VA showed different behavioral patterns regarding gaze and locomotion.